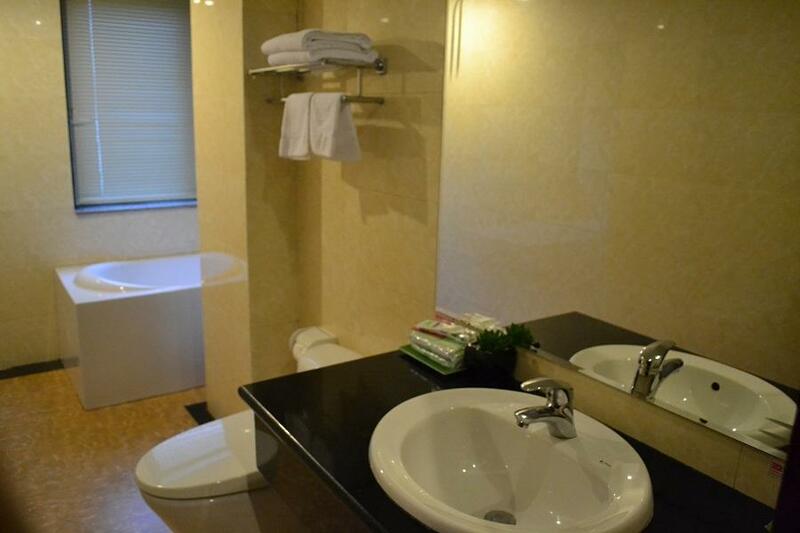 We absolutely loves the spacious, clean room and bathroom with a Great view of the first Rock Formations of halong bay. It's an half an hour Taxi drive away from where All the boats depart from. Not the right place for us. We were fortunate to secure a last minute booking but the room was a smoking room so the smell of tobacco lingered. Many noisy people on out floor (a large group) who created chaos and even managed to start a fire.... the staff seemed incapable or unwilling to stop the disruptions. WE arrived at the listed hotel at the address given expecting to find the hotel shown on your website. The "Hotel" at this addressis a backpackers hostel, not what we expected. It is tidy clean hostel but cerainly not the venues shown on your web site. They sent us around the corner(About 300 metres) to another hotel named City Bay Palace hotel which was new and clean with good staff. The only problem is that the front door stairs are so steep that I could only climb them on my hands and knees. the is no handrail. In order for us and some other elderly customrers (I'm 75 yre old) we had to walk down the dely ramp and use the staff lift to access the hotel Foyer. The rooms were very good, the breakfast was OK and the staff are very helpful. Communication with staffs and Receptionists were really difficult because they couldn’t speak English. However, when we went over to its sister hotel called City Bay Palace, their service was excellent but well, you get what you paid for. location super near to wet market..d staff was ok..but the only problem is when i walk into my room there is quite bad smell not only my rooms but my friends rooms too..so we planning to upgrade to it sister hotel which is City Bay Palace hotel..perhaps there is some miscommunication reception wont let us to upgrade so i have to re-book the sister hotel..
Staff asking us every morning are we checking out?!! Too many ants and destroyed all our sealed candy No free drinking water also it's very cheap! Generally fine, if very basic. However, shower was completely cold in the morning and when we told the staff member at reception at check out she just laughed - not acceptable. This hotel was clean but smells of smoke. It's reasonable value for money and well located. basic facilities, staff doesn't speak English, far from boat terminal to halong bay. near big shopping center but not many restaurants around. Between my room and beside it have door. It's connecting room. And beside room is higher, so we can't book. midnight 23:00 guest checked-in, and start to play with 2 man and 1 girl. so noisy. about 1.5 hour later they checked-out in midnight. Close to the water. The city closes down by 8pm. So if you are an early sleeper, this part of Halong Bay is good. No nightlife. 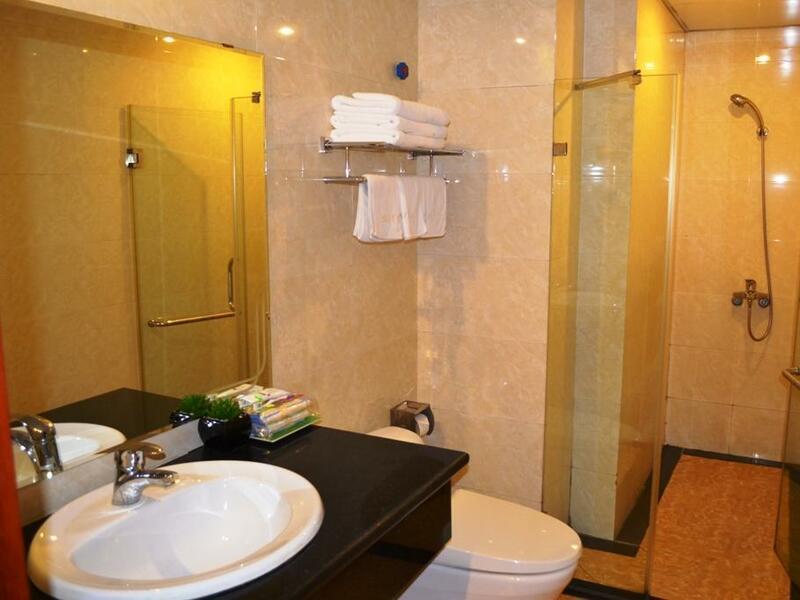 Great location on the Hon Gai side of Ha Long City, walking distance to the bayside promenade and to the ferry dock. Room was very clean with nice decor. Mattress was soft and comfortable. My room had a window, but no view, just the building next door. Ventilation could have been a little better. Even though I turned the fan to high, it was a little stuffy. Staff was friendly and helpful. I would stay there again. The price was very good. The room was clean and tidy. The shared bathroom worked well, with the good surprise of having dispensable soap and shampoo. It was not luxury but was worth the money. It is 10 mins walk to koh san Road. Nice and quiet in the evenings. Perfect place to come back and sleep in. Staff are friendly and helpful. I booked in agoda I need to paid 480.000 plus... But in the morning when I checked out, the receptionist didn't Know I booked on agoda. So said I need to pay for 318.000. I wonder why agoda is expensive than pay at hotel?? If like that, next time I don't need to book in room at agoda website. I only need to call to hotel and book then.